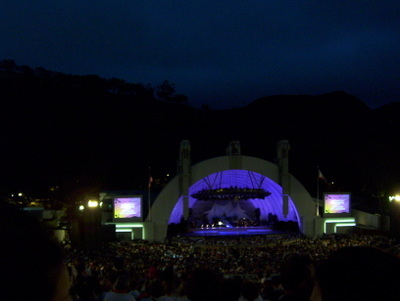 Two Sundays ago Jessica, Lauren, Carrie and I had plans to go see The Sound of Music at the Hollywood Bowl. The girls have a reverent fondness for the inimatable Julie Andrews and the idea of sitting out under the stars at the bowl, feasting on a picnic dinner while singing along with the Lonely Goatherd was pretty much all of our ideas of bliss. The Friday before, Jessica IM'ed me with bad new. It seems our tickets were not for the Sing Along Sound of Music, rather they were for a performance of the Sound of Music. No singing along and NO Julie Andrews. I was more than a little upset, however I quickly consoled myself in the idea that, even if we couldn't sing along we could still enjoy a lovely picnic dinner. Now when it comes to picnics, I think just about the perfect thing to serve is a sandwich. As much as I love them, I typically tend to avoid eating sandwiches (not that I'm a carbophobe). But for a picnic, I make an exception. Last summer when Mark and I and another couple went to see Strangers on a Train at the Hollywood Forever Cemetary I made a giant muffaletta with home-made tapenade. When we went sailing on Annie and Pierson's boat, Annie and I made up three king-sized sandwiches to share with the other passengers; a Mediterranean tuna salad sandwich with sliced cucumber and feta, a turkey cobb sandwich, and a roast beef sandwich with roasted red peppers and balsamic caramellized onions. For the Sound of Music, since it was going to be quite warm, I wanted to make something kind of light. I found this recipe in the July/August 2000 issue of Martha Stewart Living. It seemed like an interesting and unexpected sandwich that wouldn't feel heavy on a balmy summer night. Bring a medium pot of water to a boil over high heat. A 2 teaspoons of salt and the favas. Cook until they are soft and bright green, about 3 minutes. Drain in a colander and place in a medium bowl. Add 2 tablespoons of olive oil, the lemon juice, and salt and pepper. Mash everything together with a fork until combined. It doesn't have to be perfectly pureed. Preheat your broiler. 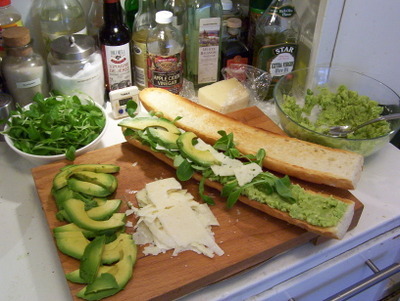 Slice a baguette lengthwise. Place the baguette, sliced side up on a baking sheet and place under the broiler for a few minutes until lightly toasted. 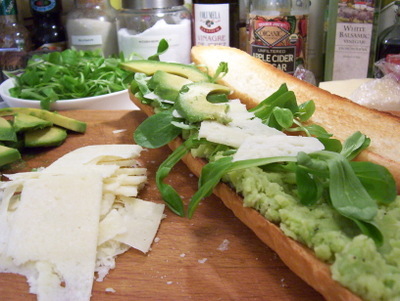 Spread the mashed fava beans on the bottom half of the baguette and then proceed to layer with the mache, pecorino and finishing with the sliced avocado. Squeeze the lemon juice over the avocado to help prevent it from turning brown, then drizzle over the olive oil and season with the salt and pepper. 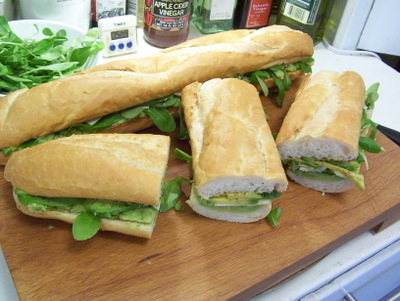 Top with the other half of the bread and then slice into 3 or 4 sandwiches. So these sandwiches are a really interesting blend of flavors and textures. The mashed fava beans are light and yet hearty at the same time. The pecorino is dry and salty which is contrasted nicely by the creamy, rich avocado. But keep in mind, they sort of need to be made pretty close to when they will be eaten, only because the the avocado will start to turn brown, even with the spritzing of lemon juice. It's great for a crowd, especially one that includes meat eaters and vegetarians alike. Vegans, I'm sorry to say, are SOL. To round out our picnic Jessica made a spinach dip (from a Knor packet - don't EVEN get me started), Carrie and Lauren brough queso dip and Sofia Coppola Chapagne in a can. I made another bowl of the immensely crowd-pleasing corn and snap pea salad with blue cheese vinaigrette. And for dessert, Jessica baked light, crisp, thin lemon wafers (from the big, yellow Gourmet cookbook). In the end, despite the fact that we weren't seeing the film, the show turned out to be fantastic. The girl playing Maria was pretty good (apparently she played Eliza Doolittle on Broadway in the most recent production of My Fair Lady) John Schneider, of Dukes of Hazzard fame, played the captain. We were all a little surprised by his amazing voice, so strong and powerful. (I confess, it made me feel a little funny.) The kids were great, in particular little Andrea Bowen who played Liesl. The woman who play the Barroness was BRILLIANT and Jeffery Tambor was great playing Max, almost as though he was channeling Phil Silvers. Even without Julie, it was pretty great. That night, the hills really WERE alive. In my defense, my spinach dip is retro and awesome, even if soup mix is involved. It's true. The spinach dip WAS quite tastey. But the lemon wafers were superb. The whole evening was fabulous, and I can't wait for another picnic/Bowl evening! I've been dreaming about this sandwich since that night. 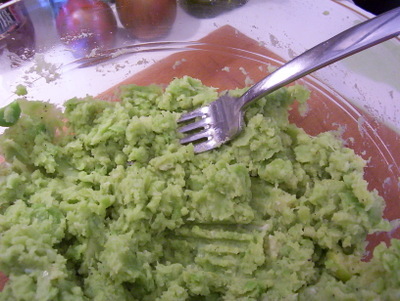 I have to admit that I've never (knowingly) tried fava beans. What do they taste like? I think I've always imagined them like lima beans, which just bring up bad memories of grade school cafeterias. Bleck. Sigh. Sounds perfect. Good meal, good pics, good company, good show! I am so making that sandwich. Thank you! As always, you dazzle me, Grant. Emma C - Thanks, although to answer your question, I'm afraid that favas are pretty similar to lima beans. However, I used to be a very picky eater and I noticed as I got older that most of my issues with foods, I didn't like, with only a few exceptions, had to do with texture rather than the actual taste. I would recommend giving lima beans another chance. 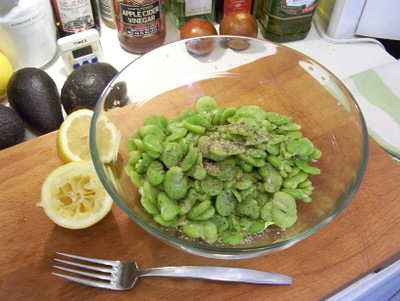 There is a recipe on here for lima bean puree as well as an appetizer of fava bean puree. Both are so delicious and might be a way to learn to appreciate the flavor of the favas and limas, without having to deal with the beans themselves, which often bring to mind depressing grammar school lunches. Limas and favas really are worth learning to like. Now if only I could just learn to like slices of raw tomatoes. That's my next hurdle. Erin - Thank you so much. The show really was surprisingly enjoyable. New Jan Brady - I hope you like the sandwich as much as we all did. You are so kind.